New! Buy Your Own Books Option! JrFit™ Youth Fitness Program is the only youth fitness program approved by all major personal training certification organizations. Virginia Board of Physical Therapy 9.75 (Type 1)–Please check with your state board for approval as most physical therapy boards will reciprocate approval for continuing education. The American Academy of Health and Fitness (BOC AP#: P3645) is approved by the Board of Certification, Inc. to provide continuing education to Certified Athletic Trainers. This program is eligible for a maximum of 9.75 Category A hours/CEUs. JrFit™ Youth Fitness home study continuing education course provides advanced training for experienced, certified trainers who wish to safely and successfully work with youth. In this course, compelling reasons and comprehensive information are presented for reversing the pervasive problem of youth inactivity and the growing epidemic of childhood obesity. This course offers a highly effective plan for enabling young people to increase their health and fitness through well-researched, safe, effective and enjoyable programs of physical conditioning, sport-specific training and nutrition. These practical recommendations include guidelines for sensible strength training and healthy eating for ages 7 to 18. Due to copyright dates, some of the textbooks for this program are no longer offered through Human Kinetics, but are readily available for purchase through other booksellers such as Amazon. We have searched for replacement titles for these books, but have not found any we like as much as those currently used. Though the copyrights are older, the information presented is still applicable in providing comprehensive guidance for working with this population. Buy your own textbooks– The JrFit Youth Fitness Program™ certificate package includes a workbook and instructions for online testing. 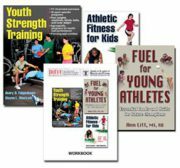 The textbooks for the program are Youth Strength Training by Faigenbaum and Westcott; Athletic Fitness for Kids by Lancaster and Teodorescu; and FUEL for YOUNG ATHLETES by Litt (which you purchase separately in your chosen format from Amazon or another bookseller.) Note: The workbook and test instructions for this course are made available for immediate access and download after purchase through AAHF. Nothing is mailed. Note: It is a good idea to check the pricing and availability of your textbooks prior to purchasing the CEC program. This ISBN/barcode number lets you verify that you’re getting exactly the right version or edition of a book. The 13-digit and 10-digit formats both work. Copy either ISBN above and enter into the search function at: https://www.amazon.com/ to find and purchase your book. You can also use this ISBN to search for the textbook from other booksellers. Once you are prepared to take the test, you go on line to complete the 100-question multiple choice test. Upon passing the test (80% score or better), you will be able to print your certificate which contains the information needed for obtaining CEC credit with your certifying organization(s). If you’re not completely satisfied with your prepaid purchase contact AAHF at 800.957.7348 to discuss a return. The return must be within 30 days of the date of receipt of your shipment. Study materials and educational resources must be received in original condition. All return shipments must be sent via USPS Priority Mail for tracking purposes to 7205 Sampal Place, Springfield, Virginia 22152. Upon receipt of the returned materials, the American Academy of Health and Fitness (AAHF) will refund full credit, excluding shipping/handling. Credit will be applied to the appropriate credit card via PayPal. We do not accept returns on online products, e-books, videos, CD/DVD-ROMs, and DVDs. The obesity statistics depicting our nation’s youth is staggering. The fitness industry is now being called upon to provide information and programming for this very important population. JrFit examines the specific needs of children regarding exercise, and what it takes to create and teach kid’s fitness programs. I highly recommend the JrFit program, I have been leading and developing children’s fitness programs for fifteen years and the American Academy of Health and Fitness has orchestrated the perfect specialty certificate to support your success in youth fitness. Fitness Director of On Top of the World Communities, Inc.
JrFit is an excellent, comprehensive program that addresses youth fitness and nutrition. This program helped me start a youth fitness program for kids both wanting to try-out for sports or just learn about being active. I also found that parents and families enjoy the nutrition programs, as they help the entire family live healthier. The books are irreplaceable resources for Athletic Training students looking for more creative ways to address youth fitness and conditioning to ready the return injured athletes. The JrFit course is an excellent choice for today’s fitness professional looking to work with youth. The program is comprehensive and will prepare anyone looking to make a positive impact in youth fitness or more advanced athletic preparation. I will recommend this course as an essential piece to learning the ins and outs of training youth and adolescents. JrFit provides the fitness professional (personal trainers, coaches, athletic trainers) with the information necessary to design sound conditioning programs for both the young athlete and growing adolescent. It dispels the myths and fears associated with youth strength training and offers research based recommendations for strength training and sports skill development, coupled with sound nutritional advice the entire family can benefit from. JrFit IS the definitive course for fitness professionals desiring a science based, comprehensive approach to training today’s youth. I highly recommend JrFit. Tammy Petersen has done a great job creating a valuable course that fills a gap in our industry. JrFit was an excellent tool for expanding my current knowledge and training ability. I found the course to be properly organized, the information was scientifically sound, and the textbooks were authoritative for this specialty. JrFit™ provides an outstanding collection of resources for fitness professionals interested in improving the health, fitness, and athletic performance of youth and adolescent populations. Programming to address the epidemic of childhood obesity has been among the top three industry trends, as identified by the ACSM’s Worldwide Fitness Trends Survey, every year from 2007 to 2010. Fitness professionals completing the JrFit™ program will be well-equipped with the knowledge and skills necessary to safely and effectively meet the demands of this rapidly-growing population of young exercisers. JrFit is exactly what I was looking for! The course materials are structured and organized in a professional way, providing easy study and absorption of the content! The information within the program is presented in a comprehensive, yet practical (information is detailed, but easy to understand – not written in a highly scientific or technically complex format) way that has allowed me to be able to immediately apply the knowledge and skills necessary to safely and effectively train children for fitness and/or athletic sports conditioning. In the JrFit program, it is easy to distinguish between the information related to general fitness training and athletic sports conditioning for kids. This is important because not all kids have the desire to train athletically, but all children should be involved in training that will benefit their overall health and wellness. The structure of this program provides a progressive learning path that will develop highly skilled and proficient trainers who will have the potential to save our youth from the negative effects of inactivity and obesity. Thank you for creating such a high quality program! Owner of Empower Training Systems, Inc. The JrFit Program has all the detailed information you’ll need to create comprehensive and customized fitness and sports conditioning programs for children and adolescents alike. The nutritional component is also very informative. There’s nothing else out there that comes close to this wealth of information and ideas. I am confident that, like me, you will find JrFit an excellent resource for training children of all ages and fitness levels. The varied and plentiful material. 2017-12-10 11:12:17 Lisa Perry NASM Strongly Agree Strongly Agree Strongly Agree I am starting a youth program in the spring and summer but am using this with the coaching i already do for XC skiing great course... greatly appreciate the workbook. great job summarizing the info and i appreciate the quizzes. through infofit in Vancouver BC.